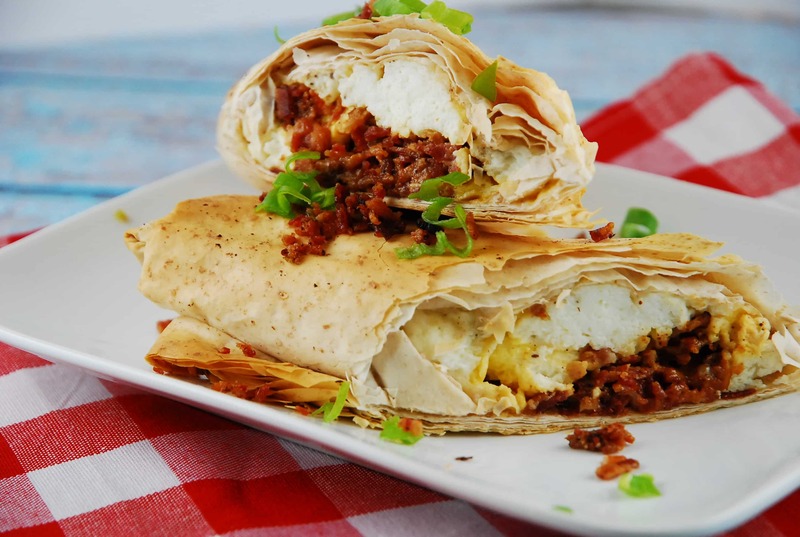 These Breakfast Phyllo Wraps are perfect for when you need a breakfast on the go! I am almost always eating breakfast while I’m in the car or while I’m walking around the house getting the kids ready for school in the morning…so something nutritious, delicious, and that can be carried in one hand is ideal. I usually make these wraps in bulk and then freeze them, so whenever I need one, I can just pop it out of the freezer and heat it up. My Breakfast Phyllo Wraps are basically a traditional breakfast of bacon and eggs topped with American cheese and rolled into a phyllo that is baked until crisp and golden brown. To keep it lighter and healthy, I used egg whites, whole wheat phyllo, and fat free cheese. If Points aren’t a concern of yours, feel free to use real eggs and cheese. Also, you add in some onion, tomatoes, mushrooms…any other veggies you’d like, if you want to bulk it up a bit. They are absolutely delicious and a great Weight Watchers breakfast idea. A traditional bacon any eggs breakfast rolled up into a crispy, whole wheat phyllo wrap. This tasty Weight Watchers breakfast is great for eating on the go. Prepare bacon according to package directions. Let cool, and then chop well. Lay out 2 sheets of the fillo dough. Spread 1/2 of the scrambled egg whites, bacon, and 2 halves of the cheese along one short side of fillo stack. Fold in long sides of fillo; roll up from one short side to make log. Repeat with remaining 2 fillo sheets. Mist each log with cooking spray or an olive oil mister. Place on prepared baking sheet and place in oven. Cook for about 20 minutes, or until golden brown. Low fat enchiladas or even cinnamon rolls made with phyllo dough is good. These look delicious, but is the picture of something other than bacon? Looks like a meat sauce maybe? I totally see what you mean, but it is actual bacon, not a meat sauce. I think it just crumbled where I cut the wrap, because I made the bacon REALLY crispy – almost to the point of being burnt, because that’s how I like it. :). This looks great! I’m always looking for fast healthy breakfasts during the school year. When making this to have on hand do you bake them before you freeze them? How long to do they typically take to reheat? (I’m assuming you use the microwave?) Thanks! I’ve never heard of whole wheat phyllo dough. Can you give me some ideas as to where I can find it? This looks like a great on the go breakfast! Thanks. I got mine in the freezer section of the store…near the frozen pie shells. The store was Whole Foods…but most healthy grocery store chains should carry it.